Kids today are more likely than ever before to suffer from body image issues, with many turning to diets that are detrimental to their overall health. Anorexia and bulimia are being seen in younger children than ever before, with some admitting to engaging in unhealthy eating rituals even before their teenage years. Parents and health professionals are right to worry about this trend, and they need to take steps to help kids to develop positive body images. The word "diet" has taken on a life of its own. When most people say that they are on a diet, they mean that they are trying to lose weight. While there is no denying that overweight and obesity are important issues, it is far healthier to think of diet in terms of healthy eating, rather than eating with a specific weight goal in mind. For kids and teens, who haven't yet finished growing, fad diets or those that are especially restrictive may cause more harm than good. Overweight kids do need to pay attention to their food choices, but for the most part, kids tend to choose diet plans that are not focused on balanced nutrition, but rather on eating foods that they love, but either in severely limited quantities or as happens in bulimics, eating to excess and then vomiting before the calories are processed. Unfortunately, such skewed thinking places emphasis on all of the wrong things - and puts kids' health at risk for the sake of fitting some unachievable and unrealistic "ideal." Teens and preteens are often exposed to an enormous quantity of images through modern media, all influencing kids' perceptions of beauty. Many of the celebrities that kids admire most fail to provide positive examples for them, however, and the photos in those glossy magazines only serve perpetuate the false idea that skeleton-like bodies are something to be admired. In their determination to achieve celebrity looks, tweens and teens sometimes take risks with their health, and in extreme cases, with their lives. Kids need to be made aware that the images they see in their favourite celebrity magazines are usually painting unrealistic pictures. Photos are often touched up to shave a bit of weight, erase stray hairs, and give the impression that actors and pop stars have perfect complexions. Anorexia and bulimia are often the sad result of poor body image. 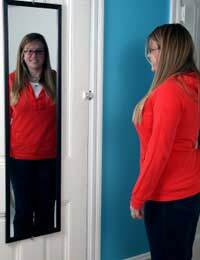 When tweens and teens (and sometimes, adults) see themselves as unattractive and overweight, they may take extreme measures to transform their bodies into what they see as a more appealing shape. Those with anorexia (anorexia nervosa) often severely limit their food intake, exercise to extreme, and feel guilty about the small quantity of food they do eat, all for fear of gaining weight. In bulimia (bulimia nervosa), great quantities of food are consumed, often in secret, but then the food is purged from the body by either purposeful vomiting or the use of laxatives. Both conditions can stem from a variety of causes, including a need to exert control, an attempt achieve some ill conceived notion of an ideal of body type, or may possibly be related to depression or anxiety disorders. Finally, parents who embark on frequent diets or express unhappiness with their own bodies may put their kids at risk for similar behaviours. Parents have great influence on their kids, even when they are at the stage when they don't seem at all interested in anything that their parents have to say, so it's important that teens and preteens get healthy messages about diet, exercise, and their growing bodies from the people they trust the most. One of the best things that parents can do is to encourage their children to celebrate their individual strengths and talents. By teaching kids that their most important qualities are not physical, they can redirect the focus from an obsession with body type to developing their minds and working to utilise their special gifts.